That Car Lot's Alive ... with the Sound of Music! 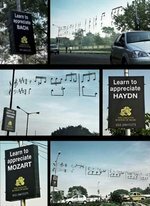 What ho: an outdoor campaign that (arguably) improves the landscape. 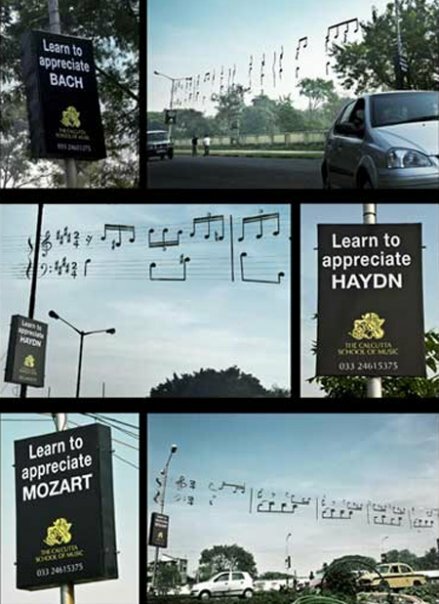 The Calcutta School of Music encourages onlookers to "Learn to Appreciate" Mozart, Haydn or Bach on ads attached to posts, which are attached to telephone wires, which were strung up with notes, like sheets of music. Would have been nice to see some random dude try playing them. If you've been following Adidas' "Impossible is Nothing" campaign for the Beijing Olympics, you're probably familiar with the format by now. 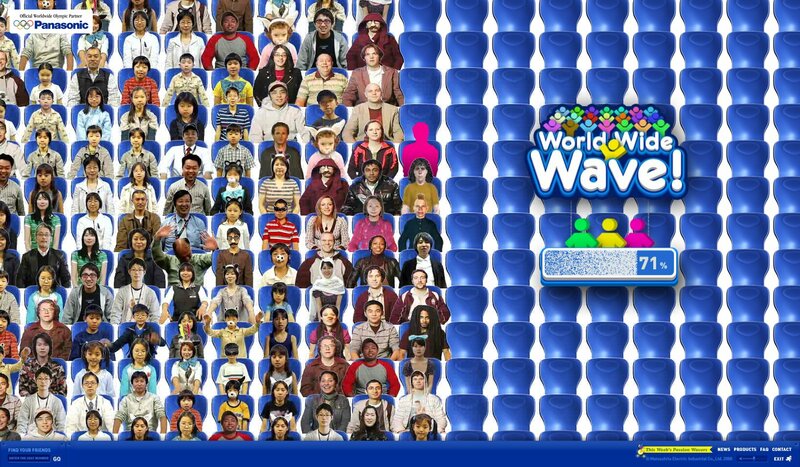 Here's the final ad, featuring Feng Kun of the Chinese Volleyball Association and some disembodied eyes that are supposed to represent a Watchful Nation. The pressure's on. I had that feeling at a spelling bee once. Unlike the CVA, I did not win my gold. Previous spots: Together, Zheng Zhi and Hu Jia. 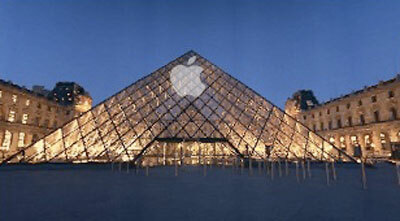 Apple is set to open its first France-based retail store right underneath the Louvre Pyramid. The store will be two stories high and will sit alongside brands like Sephora, Esprit and Virgin. The Fortune blog -- linked above -- noted the Louvre Pyramid, which was built by I.M. Pei, would complement Apple's glass-encased Manhattan Fifth Ave. store nicely. Who'll argue? Sarkozy? The Wall Street Journal? God? No. CNBC sports business reporter Darren Rovell, citing UPS' recent end to its winning streak with Big Brown in the Belmont horse race which was part of a larger event sponsorship, proposes the ad FedEx should run in response. 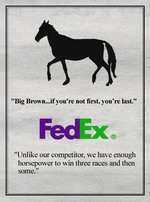 With help from CNBC in-house designer Florence, created an ad with the headline "Big Brown...if you're not first, your last." Witty. Is that a Bike Rack, or Are You Just Happy to See Me? To promote Tom of Finland, a new manly-man scent from Etat Libre d'Orange, Ogilvy/Paris attached naughty images to protruding public fixtures. Tom of Finland was a gay comic and erotica artist dedicated to preserving his craft. The Ogilvy street images follow his aesthetic. About the scent: Antoine Lie, who created the fragrance, says the perfume manifests "a guy coming out of a shower. He's clean, but not fragranced. And he puts on leather pants." o Warholian meter maids. Got a quarter for the big boys? o "...I guess I'm just lucky, Tad. As far as I can tell, I'm the only man capable of hugging my best friend." The campaign started running in San Francisco at the beginning of June. They also appeared in Paris' Marais, a big gay hot-spot, last weekend. Thanks to in:fluencia for the tip-off, and to Adrants reader Chris for the video of the Parisian wheatpasters (linked above). - Maybe inspired by Apple's limited-edition U2 iPod, Microsoft is releasing a limited-edition Joy Division Zune. - Expect downtime from Twitter when Steve Jobs takes the floor at WWDC. - Speaking of Twitter, a lot of fed-up users are defecting to a fancy new site called Plurk. Plurk enables users to follow conversational threads, and encourages use with "karma" points and little gifts. Also, the colors are soothing. - Facebook has launched an ad feedback feature. - Filipinos aren't the only people featured in creepy dating ads. - John McCain: put Obama in office if you want. But hey, if you do, EXPECT APOCALYPSE.